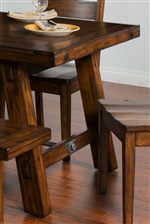 Constructed of distressed mahogany solids in a vintage mocha finish, a turnbuckle accent, plank look top, and visible joinery on the angled legs of the table add to the rustic industrial design of this table set. Two 15-inch leaves extends the table from 76 inches long to up to 106 inches long, so there will be plenty of room for larger gatherings and special occasion meals at this table. The large dining bench and ladder back chairs with contoured seats complete seating at the table. The Tuscany Distressed Mahogany 6-Piece Extension Table w/ Turnbuckle Set with Bench by Sunny Designs at John V Schultz Furniture in the Erie, Meadville, Pittsburgh, Warren, Pennsylvania area. Product availability may vary. Contact us for the most current availability on this product. Table Info Two 15-inch leaves extend table from 76 inches long to 106 inches long. The Tuscany collection starts with the quality of distressed mahogany solids in a Vintage Mocha finish. Adding industrial and rustic elements to each piece, you can transform your home's decor into an inviting place. The Tuscany collection is a great option if you are looking for Rustic Industrial Casual furniture in the Erie, Meadville, Pittsburgh, Warren, Pennsylvania area. Distressed Mahogany Solids. Turnbuckle Accent on Select Items. Browse other items in the Tuscany collection from John V Schultz Furniture in the Erie, Meadville, Pittsburgh, Warren, Pennsylvania area.